There has to be a scientific way to precisely water tomatoes in the desert without wasting water, because this is just too frustrating. I have my tomatoes planted in containers so the surrounding earth doesnâ€™t pull away much needed water. The problem that I'm having is watering consistently without over watering. Before the drought I just watered with soaked hoses with lots of Soil Amendments to increase drainage, but now I canâ€™t waste water. So now I want to water enough to uniformly wet every inch of soil and provide enough drainage as to not soak it. I'm told to use trays under the container with stands so the water will drain, but also allow the water to remain in the tray to wick back up as the soil dries. A couple of other problems are to prevent mosquitoes from growing in the tray and also capturing any excess water overflowing the tray to be reused. I'm thinking about using screen or maybe mosquito netting around the container for the mosquitoes and a deep tray maybe a larger container with a single drain pipe to capture the excess water into a closed container so I don't have to worry about over watering. I would rather just dump in a large amount of water and not have to worry about under watering as long as I can recover the excess. Anyway I just wanted to throw some ideas out there to see what others have to say about it. Itâ€™s pretty hot and dry today then I realized that I also have evaporation problems to deal with. So I guess Iâ€™ll need to use plastic instead of screen to slow down the evaporation. I think I need to come up with a way to do bottom watering without picking up the container. I'm not sure how I'm going to do this, but I'm now looking for something larger than the planter to set it in. Maybe I should be looking into HYDROPONICS to see if that might. This happened once before last year and there was no recovery. I was watering a couple of gallons a day and then I was convinced by something I read about putting a tray underneath to use in monitoring the excess water, but it only blocked the flow. The plant looked ok this morning when I added 1 gal of water, but now its looks completely welted and almost dead. 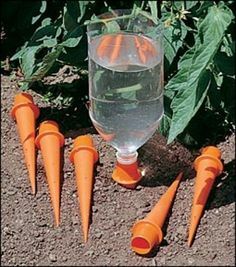 I don't know if this will help at all, but in my raised bed at home I've adapted the concept of ollas to something I can use, and have found it has dropped my water usage significantly for the garden. Basically I have bought unglazed terracotta pots and saucers and used gorilla glue to attach the saucer to to mouth of the pot. Once it has dried I fill the pot to check it for leaks through the drainage hole. Once I know there are no leaks I bury it next to a plant if it is in a pot, or at the 'intersection' between plants if it is in a bed. You fill it using the drainage hole on top. Because the clay is porous, as the soil around it dries water is pulled through the clay into the surrounding soil. The roots of the plants naturally gravitate towards the pot and obtain water that way. Because the pot is largely buried there's much less evaporation, and you can take it a step further and paint or seal the bottom and first inch or so of the pot to further reduce evaporation. Just use a stone or spare tile or something similar to cover the hole. I've created a dodgy gravity feed system with mine. Four pots are connected with irrigation hose to a 25 litre water drum. I turn the tap on the drum to fill up the pots maybe once a week. From that 25 litres I usually can keep the pots filled for about three weeks. 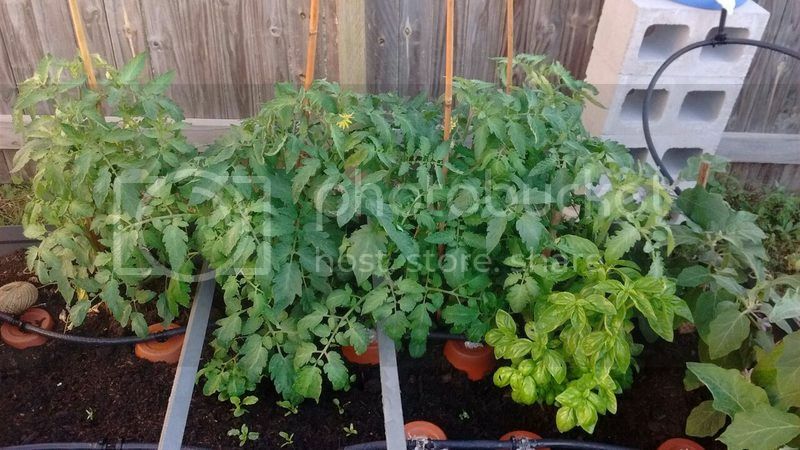 I have 4 indeterminate tomatoes, three eggplants, nine beetroot, 12 carrots, a large basil plant, 5 lettuce and between 8 and 12 radishes depending on if I've been slack with succession planting being watered from them for perspective. Just keep in mind the diameter of the pots are important for the amount of area they will provide. I use 17 or 19 centimetre pots in the bed I'm talking about. Bit of an unusual concept I know, but it works for me. When I get home tonight I'll see if I can find any pictures on my computer to show you what it looks like. Thanks Farseeker, I'd love to see a photo. I really don't think I'll be able to save this plant, but I've moved up on to some blocks so that it will be able to drain and hopping for the best. I only planted two tomato plants or actually three, but one is a cherry tomato. The one with the problem was my largest and most productive. I only heard the term "indeterminate" today for the first time and I don't know what I have. My other tomato plant is tall and thin compared to this bushy plant. it may not help you this time. But have you considered dry farming? I find self watering containers really work well in conserving moisture. I think you are using a resin pot so it will not breathe, you could use plastic mulch on top of the pot and stick try to stick a watering tube in the pot so that you water where the roots are. imafan26 wrote: it may not help you this time. But have you considered dry farming? No I have never heard of that. Anyway I think where I went wrong was putting a tray under the pot that was not big enough for full drainage. The idea was to see how much was draining out because I just didnâ€™t know how much to water it. I was using a 2 gal water can and watered it just until I saw some water trickling out the bottom, but didnâ€™t realize that not all the water was coming out. I'm still not sure how much to water and I think Iâ€™ll cut back to only 1 gal for my other plants and see what happens. Here's a photo of my (massively overcrowded) bed using the clay pot system. This is from about a month ago - those beetroot are a lot bigger now lol. So is everything else, actually! Thanks Farseeker for sharing the photo. It gives me some more ideas. Ok! Now that's what I'm talking about Thanks. Well my tomato plant has survived and actually has new tomatoes. I did spend some time this morning cutting out a lot of dead branches and I hope I didn't over do it. I starting out just removing the dead leaves, but then I noticed that most of the dead leaves were common to a whole branch so I started removing every branch with dead leaves. I think in desert conditions, best would be drip irrigating the roots. You can buy the orange points and then hook up a two liter bottle to them. The tips have little holes. I have used them and I thought the water still drained a little too fast, so I filled the orange things up with sand and let the water seep through that. N8young and RBG - both great ideas. Thank you. Thanks rainbowgardener, I think I saw those someplace or at least what I saw something that was orange like this, but I didn't know exactly what they were.